You are here21,600 Xbox 360 consoles lost in train wreck! 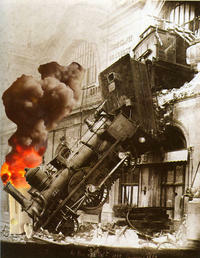 21,600 Xbox 360 consoles lost in train wreck! Last year, of course, October 17, 2007. Microsoft is suing DHL now to fit into the one year statute-of-limitations on filing a lawsuit. I guess. I'm no lawyer. More info available from GamePro. ...Microsoft said it is seeking more than US$2 million in damages from DHL for two containers of Xbox 360 consoles that sustained "impact damage, wetting, pilfering and shortage" after a derailment near Duke, Texas. Submitted by Coxxorz on October 12, 2008 - 2:54am. The REAL story is further down the page, about the dude in Boulder, Colorado buying Xbox 360's, switching them with dead ones, and returning them to the store. Is Stormblade out of work? If only I knew some people who this applied to.